Last time I shared with you, I talked about how God wants parents to teach their children about the Him. 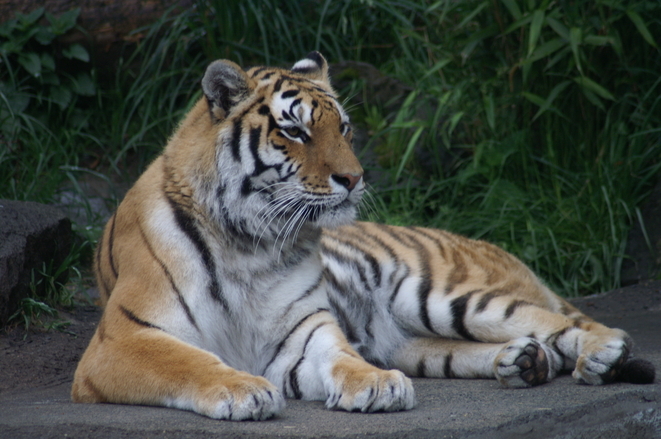 Today I want to tell you a story about a tiger that got into serious trouble. There was a family of tigers who lived in a den. Their den was a cave deep in the jungle. 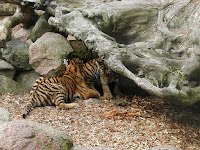 The tiger family consisted of three tigers: Daddy, Mommy and a baby boy tiger called a cub. Daddy and Mommy tiger loved their little boy very much. They named him Tyler. Tyler the Tiger is what daddy called him. They made a nice place for him to sleep, brought him plenty of food to eat and played with him as time allowed. At first, he was wobbly on his little legs, but as time went by, he grew stronger. Soon, he was running and pouncing at objects. He loved to run very fast and pounce on to Daddy’s back and growl. His growl came out like a house cat’s meow because his voice had not yet matured. He also loved to chase bugs and butterflies. One day, Daddy took him out and showed him the clearing in front of the den. The clearing was a pretty large area for him to play in. Daddy told Tyler there were dangers past the clearing, and he needed to stay close to the den and never, ever go beyond the clearing. Every evening, after daddy came back from hunting for food for the family, the two would wrestle. Every day, it seemed, Tyler was getting bigger and stronger. Daddy was proud of his boy. After they ate their meal of fresh meat, Mommy would tell stories about their ancestors and other animals in the jungle. Tyler would get excited about the rabbits and squirrels he would soon learn to hunt. However, he would cower when she told of the rhino and lions and snakes of the jungle. Those, she said, could hurt him. After story time, she would give him a bath while daddy told of how he had stalked, chased, and run down his prey for their dinner. Tyler hated his bath, which mommy did with her tongue, but he loved hearing Daddy’s adventures. He wanted to be just like him when he grew up, big and fearless! Each day, unless it was raining hard, Tyler would go into the clearing. He would lazily sit in the sun's rays poking through the trees, or he would chase bugs, lizards or butterflies. Once, a mouse wondered into the clearing. Tyler stalked it quietly then, like lightning, he pounced on it. Mommy had been watching him and told him he'd done a good job, and he could eat it for a snack. Tyler was proud of himself and thought he should be old enough to leave the clearing. “Alright,” he said, but that is not what he did. He took off like a shot right out of the clearing into the dark jungle. He ran very fast until he was out of breath. Panting, he stopped and looked around. This isn’t so scary. I’m perfectly fine, he thought. Looking and nosing around, he forgot to take notice of where he had come from so he could get back. He came upon a tortoise. He sniffed him then jumped back when the tortoise’s head disappeared! The tortoise was frightened and pulled his heard into his shell. No matter what he did, he could not get the tortoise’s head to come out. Finally, he just left it there. He spied a butterfly, so he chased it. He ran and jumped and swatted at the butterfly, but he could not catch it. He would get close and jump, but the butterfly would dart and get away. Trying again and again, he got farther away from home. He almost got it but missed again. Determined to catch it, he kept chasing and leaping and missing. Darting this way and that, he almost caught it. Then all of a sudden, there was no ground under him! He was falling down a long steep hill. He was falling and tumbling, head over heels, all the way to the bottom till--splash! Into the water he landed! He had never been in water, and he didn’t like it one bit! 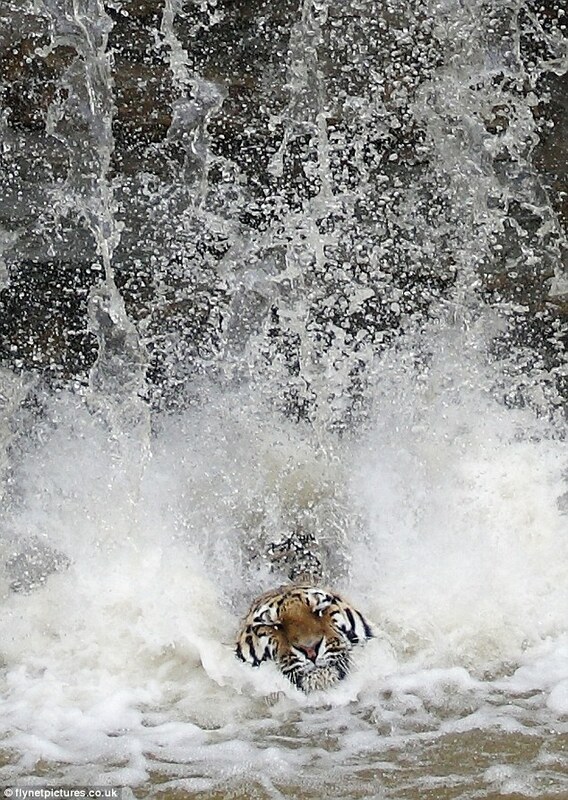 He didn't know that he had fallen into a raging river! The water was quickly taking him farther and farther away from shore. He tried to roar for help, but it came out like a tiny “meow.” “Help!” “Help!” he meowed. Under the water he went. Up he came gasping for air, coughing and spitting water. Down he went again. As he came up, he and hit a log. He tried to grab hold of it, but his paws slipped off. “Help!” he meowed again; then under the water he went. Suddenly, he was grabbed by the back of his neck up and out of the water. What, or who, has me? He thought. Looking down, he saw his daddy’s paws. With two mighty jumps they were on the top of the ravine on the flat ground. Off they went through the jungle. Tyler had never gone that fast before! Daddy didn’t stop or slow down. He ran and jagged through the dense trees. Tyler was too shaken up to speak. He was shaking because he had been terrified! When they reached the clearing, daddy slowed down and took him into the den and dropped him to the ground. Mommy immediately started licking him dry. She was afraid he would catch a cold so she was very fast and kind of rough with him. He didn’t mind her licking him this time. He knew he had done wrong. He opened his eyes and saw his daddy sitting at the opening of the den, just watching him. Mommy finished and said he could get up, but he just lay there looking from his mommy to his daddy and back again. Tyler was afraid to say the real reason was because he thought he was tough and didn’t need to stay there or obey. He just shrugged his shoulders and put his head down on his paws that were crossed in front of him. Daddy got up and came to sit close beside him and said, “Look at me son.” Tyler looked up with big eyes. “Tyler, your mommy and I love you. That is why we have given you the rule to stay in the clearing. There are dangers out there that you are not ready to face. There has been a wild lion hunting close to here that has killed animals bigger than you to take home to her family to eat. There are also poisonous plants I have not shown you. Look what almost happened to you today. You almost drowned. There is a waterfall with a several foot drop that you were being swept toward. I know you may think you are too big to need to stay close, but we will tell you when you are old enough to leave our den and clearing. That time is not now. You are not prepared or strong enough yet. Tyler went to bed angry with himself. His stomach was not forgiving him either; it kept rumbling. He had a hard time going to sleep, but he kept his eyes shut really tight. Tyler ran outside and ate the food Daddy had caught in the wee hours of the morning, while it was still dark. Soon they were playing together, the three of them, and all was all right in Tyler the Tigers world. Obedience is sometimes hard to do. We want to do things our own way. We think we know what is best for us, better than our parents do. This is not how we should think. Our parents give us rules to follow so we are safe and protected and so we will grow into good upstanding adults. The Bible says in Eph. 6:1 Children obey your parents in the Lord for this is right. Col. 3:20 says, Children, obey your parents in all things for this is well pleasing to the Lord. We want to please our parents and the Lord. To do that, we need to obey. Tyler learned to obey the hard way. We need to learn to obey without learning the hard way. Tyler wished he had obeyed instead of falling into the river. He learned the hard way. We don’t need to learn that way. We just need to obey, even if we don’t understand it or agree with it. We obey the Lord and His word, the Bible, by obeying our parents. Memorize: Colossians 3:20 Children, obey your parents in all things for this is well pleasing to the Lord.